Pink eye, swine flu, sinus infection—we’ve heard it all at College Magazine. Sometimes we don’t believe our student writers when these excuses arrive in our inbox only minutes before deadline. But other times we can’t help but acknowledge that college is a breeding ground of grossness. We feel your pain when we hear you’ve been hugging the porcelain bowl all night, and not just because you’ve mastered the keg stand. That’s why we’re helping you stay healthy this semester with a subscription to CampusMD—24/7 video access to U.S. board-certified doctors and $200 cash. Submit your vomit horror story—or a story of getting sick while in college—to [email protected], and we’ll share it on College Magazine. Our editors will select the best story based on hilariousness, delivery and creativity. The winner will receive a full-year subscription to CampusMD ($99 value) and some extra cash—that’s right $200—to keep that wallet healthy too. ­Get the Official Rules here. Format: Original essay explaining a time you got sick and/or vomited while in college. Submit: Send to [email protected], subject line: Vomit Horror Story. Deadline: Sept. 28 at 6 p.m. EST. 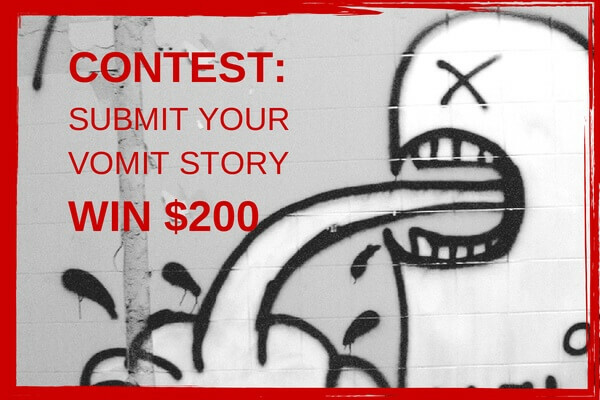 By sharing your story, you can spare an incoming freshman from the horrors. Or at least give them a heads up of what to expect. Is it Nerves or Am I Dying? *This page was updated on September 8, 2014 with more examples of Vomit Horror Stories.